The whirlwind weekend is here and we picked up Dominic in a car that had just enough room left for him and his scouting gear… Dominic just wrapped up his week of scouting and was pretty pumped to share the experience with us. He had fun dumping his rowboat as a part of his merit badge. The crafting counselor reminded him of Grandpa Pete and he enjoyed making several leather items. 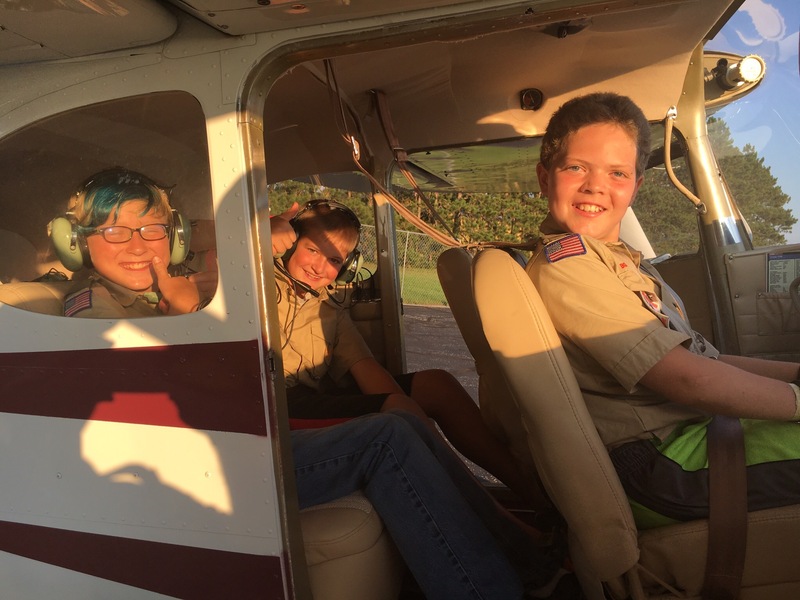 One night they got to fly in a small airplane as a part of their Aviation merit badge. Last night he slept in a shelter that he and some fellow scouts build themselves for Wilderness Survival. They enjoyed the counsellors’ skits. He climbed the climbing wall, all four sides of it. The kid is crazy tan, covered in big bites, over tired, and smiling huge! Over the past couple of days I’ve had a memory that’s kept popping back in my head. My dad picked me up one year from Camp Tesomas. I’m not sure why, but I remember it was right as Iraq invaded Kuwait and Dad and I talked about that for a while. The majority of the conversation was focused on my camping adventures and he just smiled as I shared all the stories. As a dad I’m now smiling as Dominic tells us about all of the fun he had. I’m also understanding that there was another reason he was smiling so big… Each story I shared queued up old memories of his fun times at camp, just as Dominic’s stories are doing for me. What an incredible gift to see my son so happy, and, at the exact same time, smile inside remembering scouting stories I hadn’t thought of for a very long time. I know Dad is smiling somewhere with us as he hears all the stories too, and I’m sure he’s smiling about his own stories too. Thanks for sharing all of the scouting adventures you had his week Dominic, I hope that you remember them as your kids share their adventures with you!